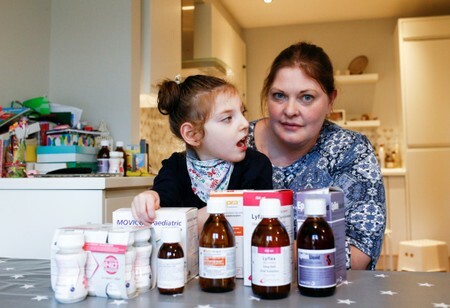 LONDON (Reuters) – With just 56 days until Britain leaves the EU, Jo Elgarf has begun stockpiling food in case politicians fail to strike an exit deal, but she says she cannot do the same with vital drugs her disabled daughter needs. Four-year-old Nora has cerebral palsy and epilepsy and relies on imported Epilim and Keppra daily to stop her suffering seizures. Elgarf wants to stock up on the drugs in case supplies are hit but she can’t because they are only available on a monthly prescription. For Nora, “this could be matter of life and death,” Elgarf told Reuters at her home in southwest London. With the clock ticking, British lawmakers are still struggling to agree a withdrawal treaty with the European Union, having comprehensively rejected Prime Minister Theresa May’s agreement last month. The default position means Britain will leave on March 29 without a deal in place unless something can be agreed beforehand. That has led to fears that supply chains will be severely disrupted leading to shortages of food and medicines. According to the British government, about three-quarters of medicines used by the state-run National Health Service (NHS) come via the EU. May, a Type 1 diabetic, has said she herself relies on insulin produced in another EU country. Last August, Health Secretary Matt Hancock outlined plans to ensure Britain had an extra six weeks of supplies in the event of a no-deal Brexit. In January, he said Britain had bought 5,000 fridges to hold medicines, making him the biggest buyer of fridges in the world, and secured warehouse space. “Making sure patients continue to have access to the medicines they need is paramount…,” said health minister responsible for Brexit planning Stephen Hammond. “We are working extremely closely with industry to make sure there are significant supplies of these drugs in the UK,” Hammond wrote in an article last week. But some Britons do not share that confidence, and anecdotal evidence from newspaper readers suggests people are stockpiling everything from children’s painkillers to medicines for serious conditions. For Elgarf, a member of anti-Brexit Facebook group “48 per cent Preppers” – a reference to the percentage that voted to remain in the EU in the 2016 referendum – that is not an option, and that has left her fearful. “It doesn’t matter even if I had all the money in the world, I can’t go and buy these medicines because they are prescription-only. I have no way of securing my child’s future,” she said. It is not just patients and their families who are concerned. The chief executive of a body running hospitals in Birmingham, England’s second-biggest city, warned last week there was a risk operations could be canceled because of a drug shortage. “In the event of a chaotic, no-deal exit, many NHS trusts could quickly run out of vital medical supplies,” Dr Dave Rosser wrote in a memo to his board of directors. According to the Brexit Health Alliance, an industry body, 45 million patient packs go to the EU from the UK every month, and 37 million packs go the other way. “Any divergence from these harmonized standards by the UK in the future, and a lack of agreement on cooperation with the EU on medicines and medical devices, would mean that supply chains are at risk,” it said. One unintended consequence of the concern is that patients stocking up on medicines might bring about problems themselves. “Hospitals, pharmacies, (family doctor) surgeries and patients should not stockpile medicines at any point during this process,” health minister Hammond said.